Mount Rainier is one of the world’s most massive volcanoes (indeed it's one of 16 "Decade Volcanoes" on the planet) and can be seen on the horizon from cities all around Western Washington. At 14,400 feet high, Mount Rainier is the tallest peak in the Cascade Range as well as the center of Mount Rainier National Park. Yet, Mount Rainier National Park has much more to offer on its own or part of a road trip. Visitors can stroll through fields of wildflowers, examine trees over 1,000 years old, or listen to cracking glaciers. It’s a truly stunning park, and one that deserves a visit. Mount Rainier National Park was one of the country’'s earliest national parks, having been established on March 2, 1899, making it the fifth national park in the United States. Ninety-seven percent of the park is preserved as wilderness under the National Wilderness Preservation System and the park was designated a National Historic Landmark on February 18, 1997. In 1906, just over 1,700 people visited the park. Just nine years later, that number rose to 34,814 people. Today, about 2 million people a year visit the park! The park is open year-round, but the time of year you choose may depend on what activities you are looking for. If you want to admire the wildflowers, plan a visit for July or August when flowers are at their peak. Cross country skiiing and snowshowing are available in the winter. And if you want avoid the crowds during summer or winter, plan a visit in the middle of the week. Always check for weather conditions before you head up, as even if the weather is sunny in the cities, there may be clouds around the mountain preventing you from seeing much of it. Likewise, snowy conditions can cause road closures and snow can happen on the mountain during fall, winter and spring. For those flying into the area, the closest airports are in Seattle, Washington, and Portland, Oregon. From Seattle, the park is 95 miles away, and 70 miles from Tacoma. Take I-5 to State Route 7, then follow State Route 706. From Yakima, take Highway 12 west to Highway 123 or Highway 410, and enter the park on the east side. For northeast entrances, take Highway 410 to 169 to 165, then follow the signs. There is an entrance fee for the park, which is good for seven consecutive days. The fee is $30 for a private, noncommercial vehicle or $15 for each visitor 16 and older entering by motorcycle, bicycle, horseback, or on foot. If you plan on visiting the park more than once this year, consider getting the Mount Rainier Annual Pass. For $55, this pass will allow you to waive the entrance fee for up to a year. 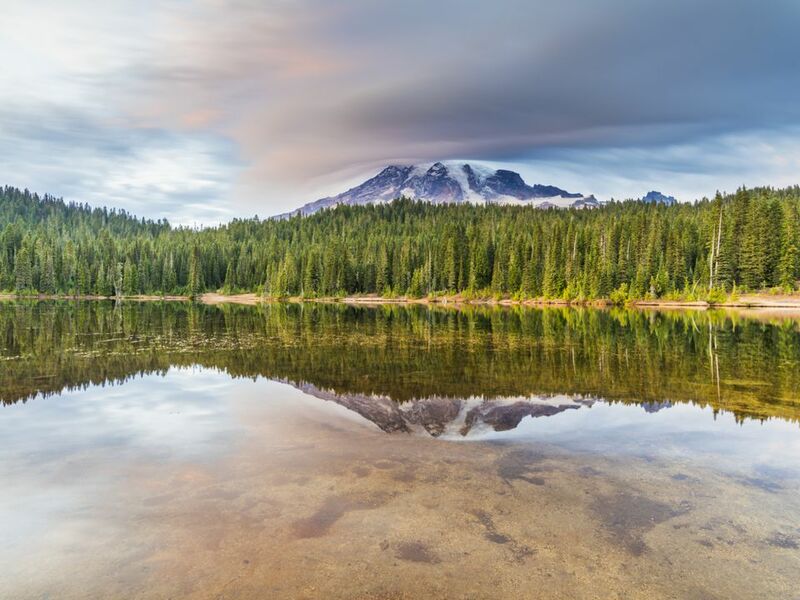 Mount Rainier National Park offers excellent opportunities for scenic drives, hiking, camping and mountain climbing. Depending on what time of year you visit, you can also choose from other activities like wildflower viewing, fishing, skiing, snowmobiling and snowboarding. Before you head out, be sure to check out the ranger-led programs available. Topics vary from day to day, and may include geology, wildlife, ecology, mountaineering or park history. Most programs are available from late-June until Labor Day. Details and short descriptions of some evening programs are available on the official NPS site. Special Junior Ranger programs are also offered throughout the park on summer weekends (daily at Paradise in summer). A Junior Ranger Activity Book is available year-round. For more information contact the Longmire Museum at (360) 569-2211 ext. 3314. Skyline Trail to Myrtle Falls (1 miles) - Wheelchair accessible with assistance. Longmire Museum: Offers exhibits, information and books sales. Christine Falls: A short walk from the pullout offers a classic view of the falls below the rustic stone bridge. Historic District Walking Tour: This self-guided tour showcases rustic architecture of the park. Eagle Peak Trail (7 miles): A steep trail through old-growth forest with great views of Mount Rainier, Nisqually Glacier and the Tatoosh Range. Sunrise: Standing tall at 6,400 feet, Sunrise is the highest point that can be reached by vehicle in the park. Carbon River: Named for coal deposits found in the area, this part of of the park receives high amounts of rainfall so the climate and plant communities here resemble that of a temperate rainforest. There are six campgrounds located in the park: Sunshine Point, Ipsut Creek, Mowich Lake, White River, Ohanapecosh and Cougar Rock. Sunshine Point is open year-round, while others are open late spring to early fall. Check campground conditions on the official NPS site before you head out. Backcountry camping is another option, and permits are required. You can pick one up at any visitor center, ranger station and wilderness center. If camping isn’t for you, check out the National Park Inn and the historic Paradise Inn, both located with the park. Both offer affordable rooms, fine dining, and a comfortable stay. What Makes Tacoma's Chinese Reconciliation Park So Special?